Are you interested in fighting to improve bus service in your community? Then Active Trans would like to partner with you to advance our bus advocacy work! 1) Faster boarding – speed up the boarding process at busy stops by allowing riders to pay before they board and board through all doors. 2) Transit signal priority – allow packed buses to hold a light green for a few seconds longer to make it through a busy intersection. 3) Dedicated bus lanes – give crowded buses priority on city streets with dedicated bus lanes. Buses go places where the rail network does not and they’re often the only public transit option in low-income communities and communities of color. These improvements are cheaper than rail upgrades and can be done faster, but Chicago has only pursued them on a few streets. 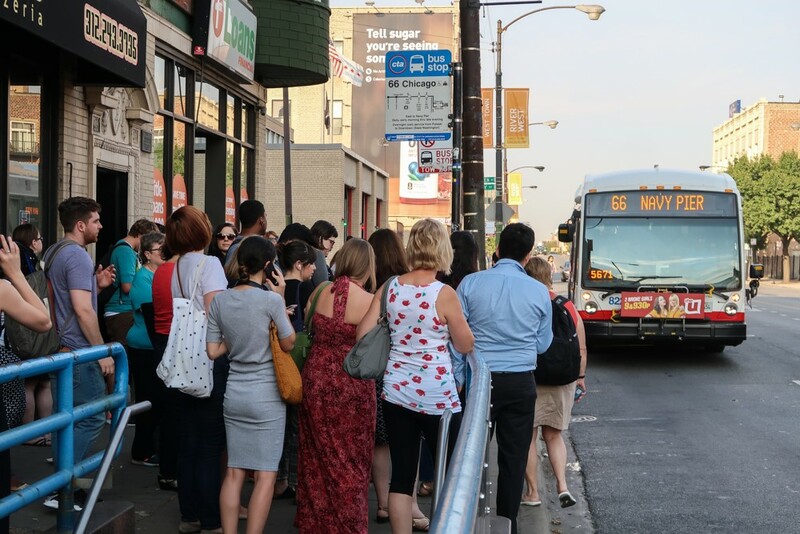 Active Trans is developing report cards to evaluate the speed and reliability of bus service in each ward in the city of Chicago. We plan to use these report cards to mobilize transit riders and community-based organizations to advocate for better bus service in their neighborhoods. We plan to partner with four community organizations around Chicago to dive into this work collaboratively. We have four $1,500 grants to support organizations interested in mobilizing their local constituents around bus service issues through actions of their choosing. Please contact julia@activetrans.org by the end of March if your organization is interested in learning more about this opportunity to work on improving bus service in your ward! If you are an individual looking to advocate for better bus service, sign up for our advocacy supporters list so that you will be made aware of future opportunities to get involved and voice your support. We will also be organizing individuals to meet with their local aldermen to advocate for better bus service in their wards. We are inspired by the Bus Turnaround campaign in New York City and similar fights to improve local bus service in cities across the country. This campaign is supported by TransitCenter, a national urban mobility foundation.